A useful tool for web developers built on Cygwin for Windows (tested on Windows XP). I haven't seen a port for Windows anywhere so I thought about sharing this since this is a very handy application. ELinks is an advanced and well-established feature-rich text mode web (HTTP/FTP/..) browser. ELinks can render both frames and tables, is highly customizable and can be extended via Lua or Guile scripts (not included in my build though; see image below for supported features). 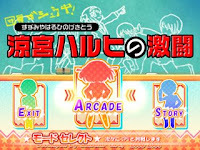 The second 3D doujin game featuring the characters from Suzumiya Haruhi no Yuutsu from souvenir circ. The first was Suzumiya Haruhi no Chourantou. Too bad this doujin group got the signal to stop redistributing / updating both of its Haruhi games by the franchise owners. Oh well. A useful tool for web developers built on Cygwin for Windows. Another alternative uploader for multiple file hosts. A patcher is included so you can change your MU upload descriptions. A GUI to the link compiler for bulk usercashing of links. Host your own Megaupload leecher! Stay on top the most common codecs! A screenshot grabber/thumbnail maker. A very good alternative to MPC's built-in grabber. A smaller alternative upload manager for MU. But stick with Mega Manager if you have premium. A.K.A. "HOWTO: Add external subs to an RMVB"
A small, standalone MP4 media player.